Product prices and availability are accurate as of 2019-02-03 03:24:07 UTC and are subject to change. Any price and availability information displayed on http://www.amazon.com/ at the time of purchase will apply to the purchase of this product. PLEASE DO NOT ORDER THIS HANDLE SIZE UNLESS YOU ARE SURE IT WILL FIT YOUR HANDLE! THIS HARDWARE SET ONLY WORKS ON THE SMALL HANDLE SIZE WHICH VERY FEW PANS ACTUALLY HAVE. These are replacement screws, nuts, and hanging loops for the smallest size vintage era (two screw type) Revere Ware pan handles. These parts are newly manufactured and are made to look and work just like original Revere Ware hardware, with the exceptions noted below. Measurements: Screws are .35 inches (9.5 mm) long including head. Barrel nuts are .5 inches (13 mm) long including head. 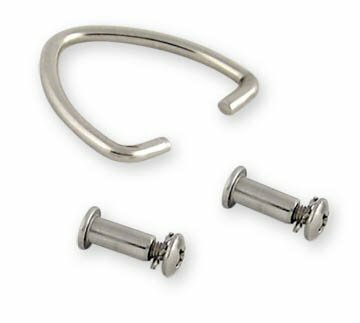 The hook is slightly smaller than the similar hardware set made for medium, large, and x-large 2-screw vintage Revere Ware handles to make it easier to crimp on. Fits: Vintage era small Revere Ware pan handles (i.e. for 6 inch skillets). These fit Revere Ware pans with handles that have two screws through the Bakelite. These will only work with the small two-screw vintage style handle. These screws and nuts will not fit in the larger handle sizes or the single screw newer handle. Replaces: The original Revere part number for the screw/nut/washer set was 36079 and for the hanging loop was 2501. Note that we are selling these in pairs of two sets, to help reduce the shipping cost per single item. Includes two sets, enough for two separate pans.